HEADS UP! Ruger No. 1 rifles for 2018. Thread: HEADS UP! Ruger No. 1 rifles for 2018. There is at least ONE, it is a total custom one off and cost me a bunch of lettuce, used. Twenty some years ago, The Cast Bullet Association was begging Ruger to make up some 30-30's, but Ruger refused. We tried to get members to commit to buying them and still it was a "NO-GO". Don't feel bad. They didn't make anything for the .41 mag fans either. I've heard a number of people want to convert theirNo.1 to 35 Whelen why not just get one in 9.3 by 74. It'll do more than the 35 Whelen and works really nice in the number one with the rimmed cartridge. Itching to try ol' No.358430 and 358009 paper patched over FFg and a grease cookie. Finally, the 30-30s are rolling out. Mine is supposedly on the way, and I confirmed it with a second phone call. Short barrel, stainless steel is not my cup of tea. 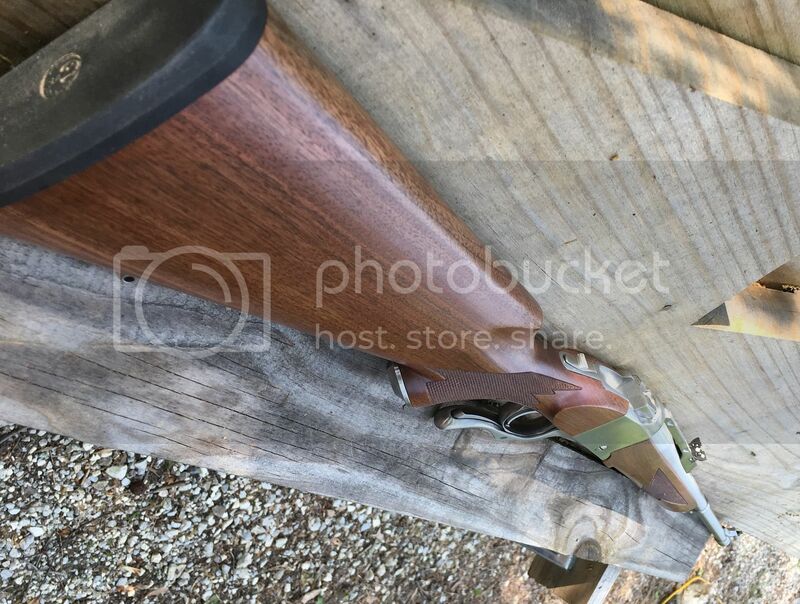 Blued with 26" barrel, I'd be there. It's REAL ... it's wood and steel! I got the K1A. I wanted SS for weather proofing (humid here in the swamp, indoors and out) and the short barrel for being handy where we hunt. Here, a 30-30 is thought of as a brush gun. No long range shooting in the swamps. It'll still be good for a hundred yards if I ever hunt any place that open, but my longest shot ever on a deer was 43 yards, so it's not likely I'll need a sniper model. This'll be perfect! Currently casting, reloading and shooting: 223 Rem, 6.5x55 Sweede, 30 Carbine, 30-06 Springfield, 30-30 WCF, 303 Brit., 7.62x39, 7.92x57 Mauser, .32 Long, 32 H&R Mag, 327 Fed Mag, 380 ACP. 9x19, 38 Spcl, 357 Mag, 38-55 Win, 41 Mag, 44 Spcl., 44 Mag, 45 Colt, 45 ACP, 454 Casull, 457 RB for ROA and 50-90 Sharps. Shooting .22 LR & 12 Gauge seldom and buying ammo for same. Lipsey's did a small run of 30-30 blued #1As 10+ years ago. Bought one and never took it out of the box. Have never seen or heard of another. Nice, watching for the range reports. Nicer wood than my latest NO1, kinda jealous. That right there is beautiful. Please don't let it be a Safe Queen. I KNOW you ain't gonna ever shoot a factory load from your new rifle, are you? I don't have any factory loads around. I do have a few hundred cast up for it and I just have to load them. I have a serious racoon problem that needs the application of a good 30-30. Fine looking rifle for sure. Bet it shoots as good as it looks. 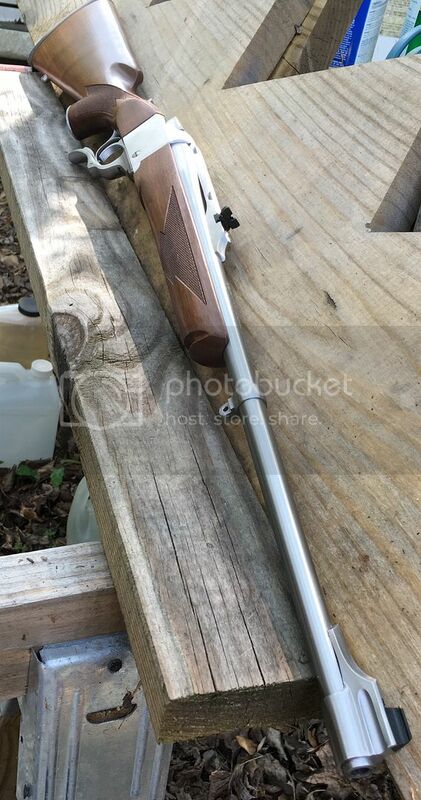 I generally do not care for stainless firearms, guess it’s the plastic stocks usually seen on them but that is a very attractive looking rifle.